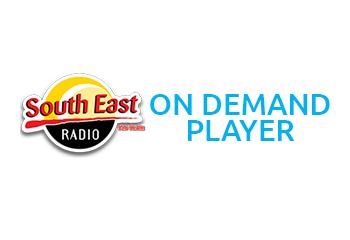 It was a night of firsts: The first overall South East Radio/Talbot Hotel Outstanding Achievement Awards Gala Ball, our first posthumous award winner and the first live broadcast of the awards ceremony from the Talbot Hotel, Wexford. Huge congratulations go to our 2014 Overall Outstanding Achievement Award winner Michael Morrison, whose proud parents Breda and Edward received the award on his behalf. Michael Morrison passed away in July 2014, at the age of 38. He was diagnosed with Cystic Fibrosis very early in his life and was told he will not make it past 12 years old. He is fondly remembered as a strong character, helpful and kind, by all who knew him. Throughout his relatively short life his ambition was to help other people and he spent a great deal of his time and energy to promote good causes. A UCD Michael Smurfit Masters Graduate, Michael wrote books to give hope to people that were suffering and the funds from the sales of those books go to the Tracy Lawlor Trust, a Cystic Fibrosis charity www.tracielawlortrust.com. Michael completed three more books awaiting publication and the funds raised from these books will also go to charitable organisations. Michael organised numerous charity events, balls and soccer blitzes. He was appreciated by everybody he worked with and most of all by his family. A tireless worker with a great joie de vivre, as his parents describe him, Michael will be remembered by everybody as an inspirational young man. His mother, Breda receiving the award on his behalf, recalls Michael’s positive outlook on life, his drive to enjoy every moment and his belief in the importance of kindness in words and actions to all, as we can all make a difference to the world we live in. 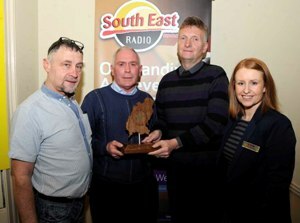 Congratulations to Michael and his family and of course to all of the monthly South East Radio/Talbot Hotel Outstanding Achievement Award winners, the unsung heroes in our community. 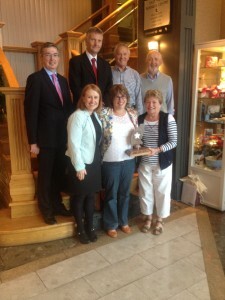 Trudie Core is the founder of “Wexford Mammy’s”, the online community which offers free advice and information to all mothers in County Wexford…. and beyond. Being a mother herself gave Trudie the idea to create help on line as she realised how important it is to talk to other mothers and share advice and experiences. The community which now numbers over 8,000 members with 5 administrators, is a great place to find information about childcare and anything related to bringing up children. It’s also a handy source of useful information about local businesses and services. An added benefit has been the ability of the on line community to raise funds to help families in need through the kindness of its members. All parents know how panic can set in when your child is poorly or when you are having difficulty in finding the best way of teaching your child new things. On “Wexford Mammy’s”, any parent can ask questions about anything child related and they will get an answer from another parent who dealt with the same things. It is heart-warming to see that a young woman such as Trudie, who was only 22 years old when she founded “Wexford Mammy’s” found the time to do something for the community. Trudie has a great entrepreneurial spirit and has now set up her own business. We wish her best of luck in her new venture and hope that more young mothers will follow her steps! Dyspraxia is a difficulty with thinking, planning and carrying out sensory or motor tasks. We don’t hear much about it but it is a condition from the same “family” as autism, or Aspergers. From Bunclody, Veronica Kenny, a mother with two sons with Dyspraxia offers help and support to other parents who find themselves in a similar situation. Veronica set up the only Dyspraxia support group in this part of the country, where parents can get information, advice and moral support from herself and also from the Spectrum Group (Autism Spectrum Disorders Initiatives). ASDI is an organisation formed to help and inform parents of children who have autism, Dyspraxia or other motor disorders. Studies show that 6% of children have some level of Dyspraxia and need help and information. The HSE waiting list for diagnosis is approximately 4 years. As speed of diagnosis is essential for early intervention, the majority of parents go with their children as private patients for assessment. Once diagnosed, children can get all the support they need in school or when they play sports and can improve their skills in time. This is one of the reasons why Veronica’s work is so important and makes a difference. She can direct parents towards the right people; the right kind of help and make a difference for a child facing difficulties. Veronica’s work for this cause is tireless and is truly appreciated by all. Although she has some difficult times with her 2 sons with Dyspraxia, she finds time and energy to give help and advice to others in the same situation. 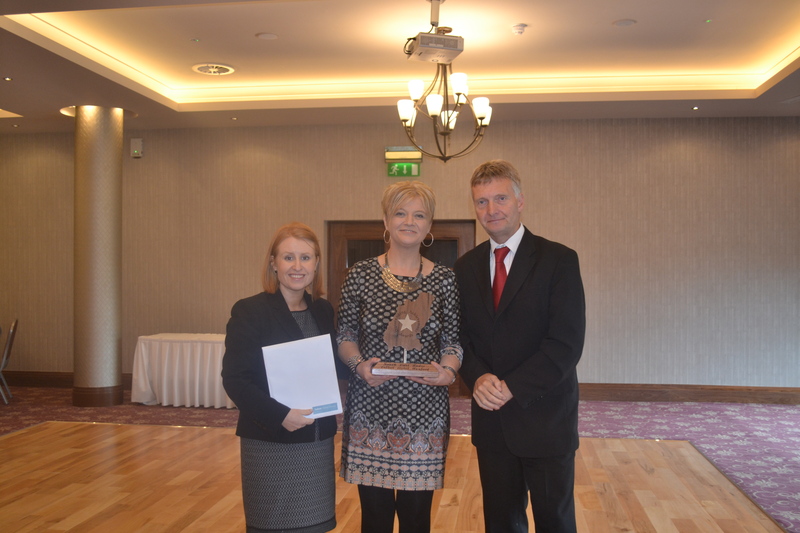 Veronica Kenny is an inspiring person and our November Winner of the Outstanding Achievement Award. Congratulations to Breda & Edward Morrison who accepted our October Outstanding Achievement Award on behalf of their son, Michael Morrison. Throughout his relatively short life his ambition was to help other people and spent a great deal of his time and energy to promote good causes. A UCD Michael Smurfit Masters Graduate, Michael wrote books to give hope to people that were suffering and the funds from the sales of these books go to the Tracy Lawlor Trust, a Cystic Fibrosis charity www.tracielawlortrust.com. Michael completed three more books awaiting publication and the funds raised from these books will also go to charitable organisations. 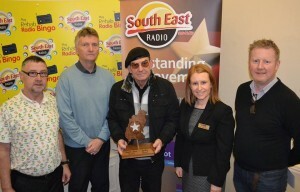 South East Radio, together with the Talbot Hotel are very proud to give Michael the first posthumous Outstanding Achievement award for all his great work in helping charities and giving people hope. Sandra is one of the most inspirational people in county Wexford. A Cancer survivor, Sandra is now involved in a number of cancer charities, giving her support and sharing her advice with those who are still fighting this horrible disease. Sandra was diagnosed with Pseudomyxoma Peritonei, a type of cancer which affects 1 in a million people. This type of cancer was not operable in Ireland at the time so the UK was the closest alternative. The cancer was caught in time and whilst the doctors moved quickly it was a year after her cancer diagnosis when Sandra had major surgery in the UK. The ordeal she went through because of the big C, meant that she was away from her children, James 7, and Aaron 5 for seven weeks. She was in a wheelchair then for 8 weeks following the operation and with the support of her family and friends she regained her strength and is now sharing her experience and encouraging other cancer sufferers to fight. Cancer is unfortunately a disease we keep hearing more about, but caught in time, and given appropriate treatment it can be cured. Sandra’s experience has taught her that you have to live every day the best you can, and her advice to people who are going through battles like hers is to stay positive and believe in yourself that you will beat cancer. She is bringing all of us a message of hope and as she says it: “Get up and fight, never give up”. 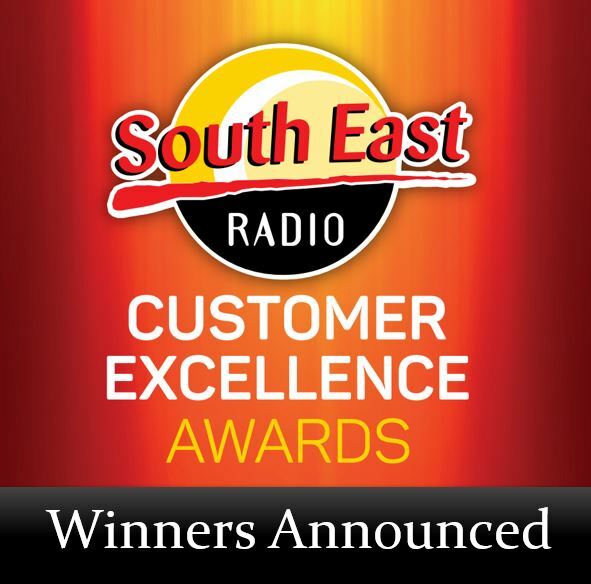 For trying to make a difference and offering her support and encouragement, Sandra gets a well-deserved Outstanding Achievement Award from South East Radio Station and the Talbot Hotels. 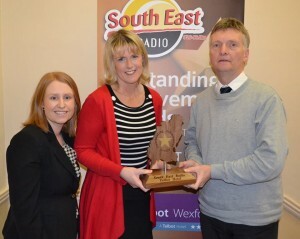 South East Radiotherapy Trust is in operation for over six years, helping patients to travel comfortably from all over the South East region to Whitfield in Waterford for their radiotherapy treatments, five days a week. This service, financed solely from voluntary contributions, not only helps the patients, but also their families, by relieving some of the pressure associated with travelling every day. None of this would be possible without the amazing energy, time and care Niamh and Catherine put into the service. They are two dedicated volunteers who enjoy making a difference in the lives of people going through a hard time. Catherine and Niamh prepare the monthly schedules for all the volunteering drivers and ensure everything runs smoothly. This is not an easy task as they deal with so many people, both volunteers and patients, in the course of providing the service. With the support of ex-patients and people around Wexford, they can continue to offer the service to anybody who needs it. Those who travel on the buses form bonds with many becoming friends. Most importantly they give each other much needed support. The volunteer drivers are the people who witness the hardship the patients have to face and they are the first to praise the existence of the South East Radiotherapy Trust and the great work of Catherine and Niamh. The drivers enjoy the drive to Waterford, with everybody joking and having fun, but then the way back is always different and that is when the support and bonding really matters. In support of this service functions are frequently organised either by people who used to travel on the buses, or by volunteers working for the trust. We would like to say a massive thank you to Catherine and Niamh, two wonderful ladies who give so much to their peers, and make a huge difference in the community. 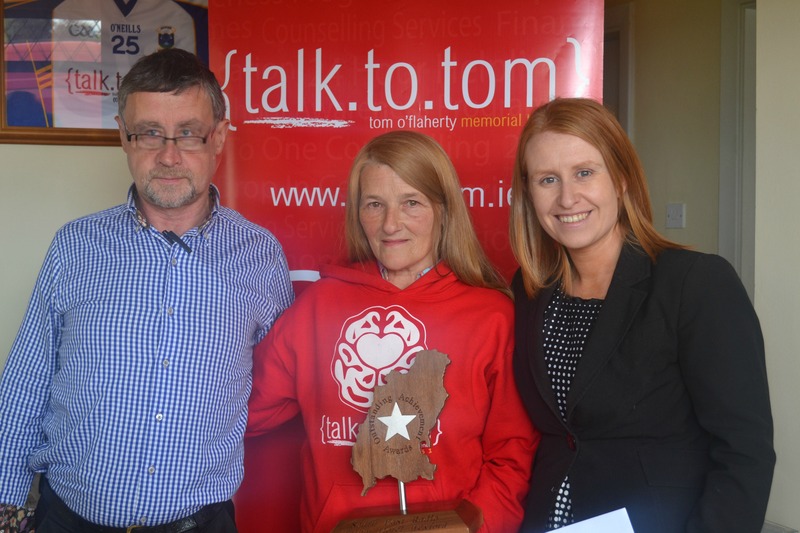 When Liz O Flaherty lost her 25 year old son Tom to suicide 2 years ago, it triggered a chain reaction of emotions for her. The initial shock of the sudden loss settled into trying to understand why this had happened to her outgoing son Tom. By all accounts outwardly Tom had everything to live for. He had just qualified as an electrician. The Gorey Rangers U11 team he coached had just won a cup and he was over the moon. He displayed no signs to his family that signaled his pending fate. In the days that followed his passing, Liz became acutely aware that her family weren’t the only family touched by mental issues. People approached her at the funeral and confided that family members had depression, some as young as 7 and 8 years old. They didn’t know where to turn for help. In answer to this need, Liz , her son Conor, her brother Ray and his son Adam founded “Talk to Tom” in July 2012 . Talk to Tom is a drop in centre located at Fort Road, Gorey where help is at hand for anyone that needs to talk and see trained Counsellors. A charity shop located on St Michael’s Road helps fund the running of the centre. Out of terrible tragedy, a service providing essential support to those in need is borne. Well done to Liz for making a positive contribution to her community. Anne’s involvement with young people in Enniscorthy is well documented over the years. Whether it is helping to prepare participants for the Community Games or the Special Olympics, Anne has a special love of working with young people. She says that not does she really enjoy their company, she says that it keeps her young! She is a great advocate for young people and she is very pragmatic, knowing that sport doesn’t appeal to everyone but she says in Enniscorthy they are very fortunate to have something for everyone. Anne is actively involved in athletics and rowing, winning a silver medal at the World Police and Fire Games held in Belfast in 2013. 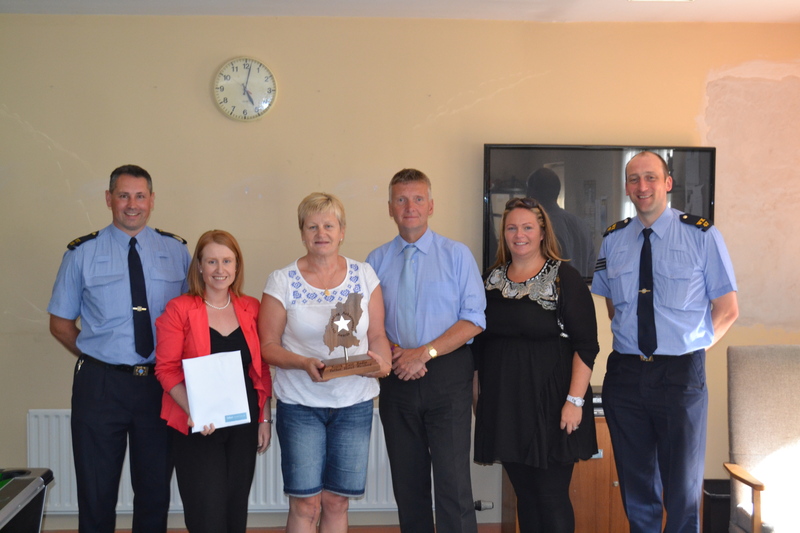 She has done much for athletics within the Gardai, borne out in 1999 when she is was awarded a prize for the Outstanding Contribution to Garda Sports for Athletics at the Ferrycarrig Hotel Wexford. 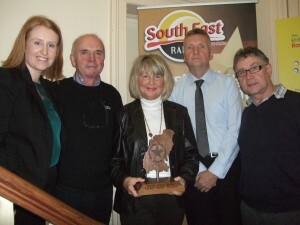 Anne is well known throughout Enniscorthy for her involvement with young people. Now that she is retired, she will continue working to promote their involvement in sports. No doubt the youth of Enniscorthy will do her proud bringing home chest fulls of medals, testament once again to Anne’s mentoring, training skills and dedication. The untimely death of his beloved brother Paul spawned an advocate in Noel Butler to promote the benefits of mental health awareness. As Noel observed when receiving his Outstanding Achievement Award, that he may not be able to change the past but he hopes he can have a positive influence on the future. Last September Noel joined Wexford Cycling club “Wexford Wheelers” to train for the then forthcoming”Cycle Against Suicide” event. 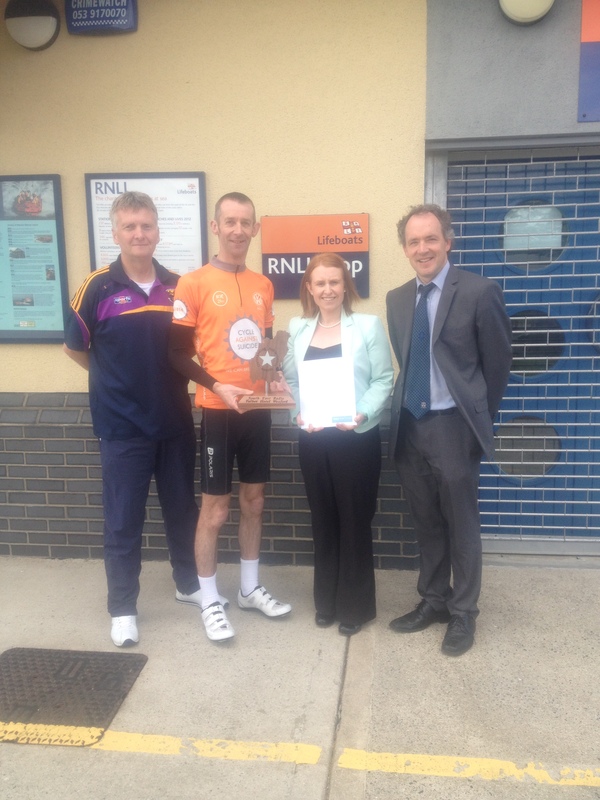 The 12 day event took place all around Ireland covering 1200 kms and involved over 7,000 cyclists. Their message was loud and clear “It’s ok not to be ok, Its ok to ask for help”. Noel says not only does exercise have a positive impact on your physical health it plays a very important role in maintaining good mental health, therefore the link with cycling to create awareness of the importance of asking for help is no coincidence. Taking up any sport in the pursuit of good general well being is the message for all of us. 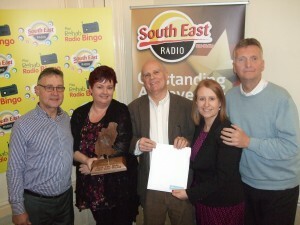 Noel, a popular winner of this months award, paid tribute to his brother Paul and his family. Congratulations Noel for all your fantastic work in raising awareness of the importance of good mental health for everyone. 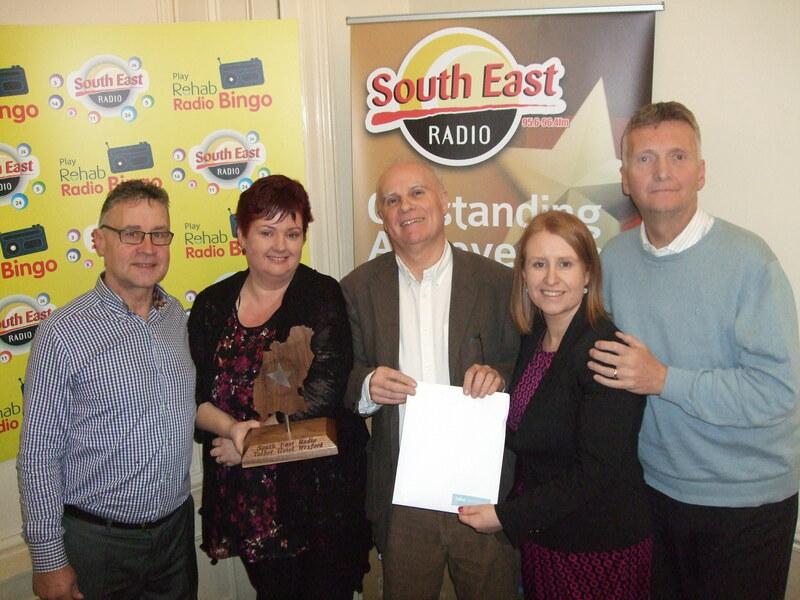 A stunned Monica Morton is April’s recipient of South East Radio’s Outstanding Achievement Award in association with the Talbot Hotel at Jack and Jill’s Playschool Oulart, surrounded by her family and friends. A popular winner, Monica works at Jack & Jill’s Playschool. A mother to 6 children and grandmother to 5, Monica still finds time to work tirelessly for her 3 passions. Her Down Syndrome son Martin, inspired her involvement in fund raising for Down Syndrome Ireland, St Patricks Special Needs School and now Enniscorthy Community Workshop. Her daughter Catriona says she is a fantastic mother and grandmother to her 3 grandchildren. 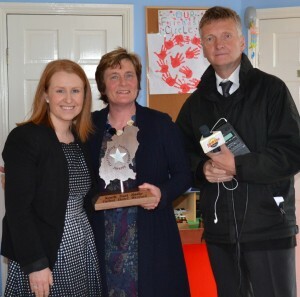 Ann Marie Furlong, Deputy Principal of St Patrick’s Special Needs School, Enniscorthy, says that Monica continues to fund raise for St Patrick’s even though Martin has moved on to Enniscorthy Community Workshop. Monica in fact organised this weekends ( May 4th) Church gate collection! No matter what fund raising event is on for the school, Monica is always there. Well done and thank you Monica for all of your hard work. 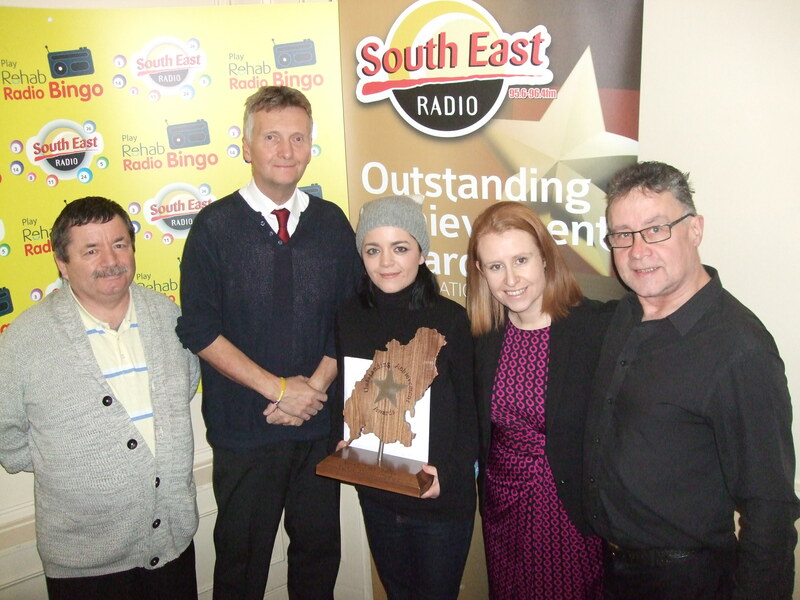 A big well done to Jimmy Crowe, a true inspiration to us all. Following his second encounter with cancer in 2009, Jimmy decided to give something back to his community and to the hospital that helped him during his treatment. Santa brought him a bike and after 40 years absence, Jimmy was back in the saddle! Starting off gingerly, with his now 14 year old foster son, he could be seen cycling around Ballygarrett in hail, rain or snow getting bike fit for all of his cycling adventures. With a group of family members and friends, he cycled to raise massive funds for charities close to his heart. 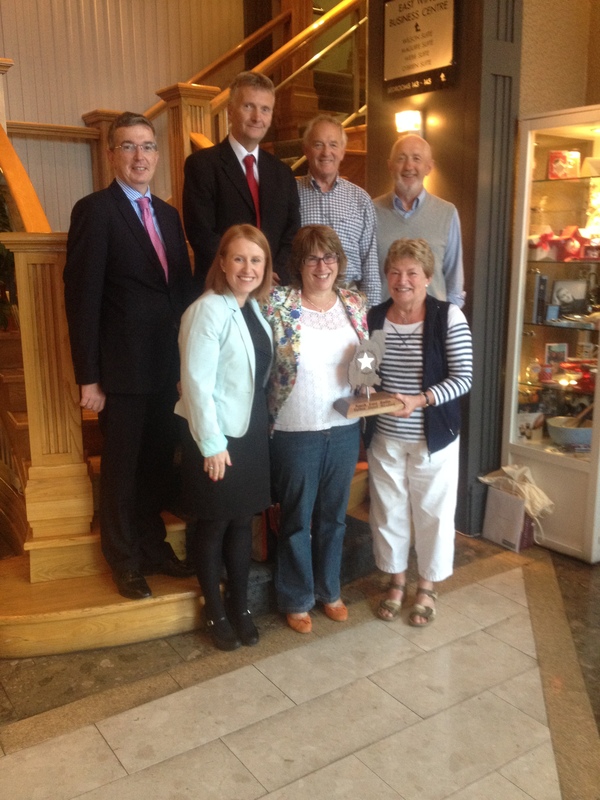 He raised €37,000 for research and development for St Lukes hospital. He volunteered to help a group of special needs parish members go to Lourdes and has since raised over €3,000 for St Patrick’s Special Needs School. A father to 5 grown up adults and a foster son, Jimmy is a family man and has helped raise €5,000 for his local Youth Club. And if all of this wasn’t enough he raised €4,000 for Our Lady’s Hospital for Children in Lourdes. Jimmy has his sights set on another cycling venture in August, this time fund raising for North Wexford Hospice. We wish Jimmy continued success with all of his fund raising initiatives. Joanne from Kiltealy, is the epitome of what the monthly awards are all about. She is the mother of 3 children. Eoin, her middle child who is 9.5 years old has Down Syndrome. She says her family are the center of her world. Joanne has worked as a specialist children’s nurse with the Jack and Jill Children’s Foundation for over 10 years now. The Jack and Jill Children’s Foundation helps support families who have children with severe neurological disabilities. They also support children under four years who sadly have conditions which they won’t recover from, providing 24/7 on call care for those families. Rather than being sad or morose about this Joanne says that it is an honour to be involved with families during such emotionally difficult times. Joanne also has volunteered as a parent link counsellor for Wexford Down syndrome branch, along with being a committee member for the last nine years. She is described as being at the “beck and call” of people in the community. She values community spirit and understands the importance of the role local shop or post office plays in providing services and sometimes just companionship particularly to the elderly. Joanne was on the original organising committee for the local childcare centre which is thriving in the community today. Well done Joanne, a well deserved winner of the Outstanding Achievement Award. 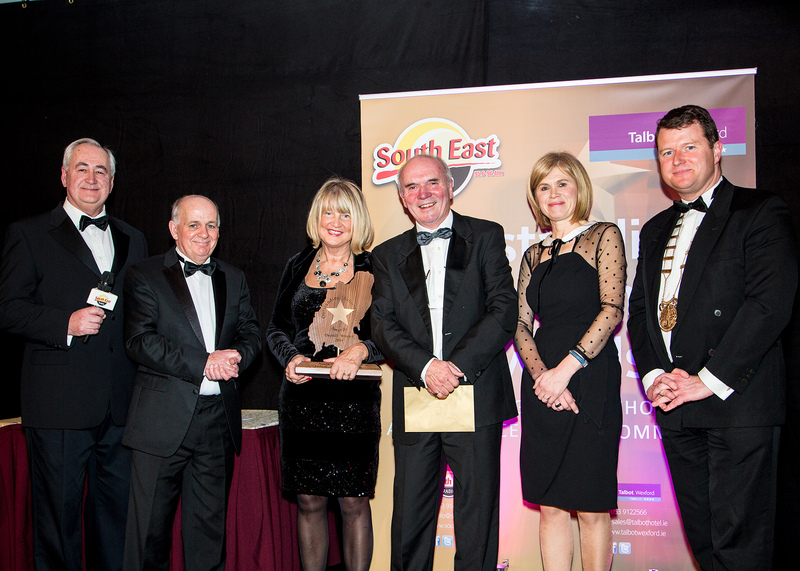 Joe Ahearne Murphy is the first winner of the Outstanding Achievement Award 2014. Joe, a popular award nominee, has been a “saviour” to hundreds of neglected horses who in many cases have been starved, abandoned and left to die. Joe rescues these horses and brings them to Holly’s Horse Haven, a rescue centre where the horses receive the help and care they need before they are allocated new homes. He swims on St Stephen’s Day to raise money for Holly’s Haven. He is modest and unassuming and never looks for recognition. He is truly an unsung hero and a deserving recipient of the January Outstanding Achievement Award for his work in the community helping distressed horses. 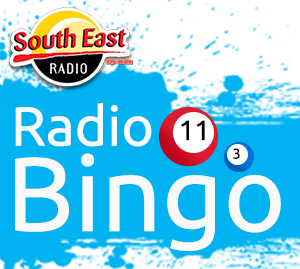 A big congratulations to Joe from everyone at South East Radio and the Talbot Hotel Wexford.